Protests against state sponsored violence in Nicaragua. Source: Wikimedia Commons. All Rights Reserved. The repression of Daniel Ortega’s government against students and the unarmed civilian population that keep on protesting in the streets has left so far more than 300 dead, and the number of wounded and missing is rising daily. The trend has not slowed despite the establishment of the so-called National Dialogue Table, which shows that Ortega is just buying time. The Episcopal Conference of Nicaragua (CEN) chose the participants who were to sit at the Dialogue Table before the government. They were big businessmen from the High Council of Private Initiatives (COSEP) and the American Chamber of Commerce of Nicaragua, a delegation of students and members of civil society (a representative of the peasant movement, one of the Costa Caribe autonomous region, and another one of the autonomous trade union movement). The Dialogue’s inaugural session was held on May 16. Since then, progress has been slow because repression has not stopped and the government is refusing to address the Roadmap to Democracy which the Episcopal Conference has put forward. This document proposes early elections on March 31, 2019, a prior reform of the Electoral Law and the appointment of new electoral authorities. The President disregards this demand for his early departure as a "coup" and presents himself as the victim of an international plot to oust him. Some left-wing parties in Latin America, unable to make a distinction between Ortega’s pseudo-revolutionary rhetoric and his neoliberal practices, have joined him in this discourse. Moreover, they adopt an ethically reproachable position by justifying the massacre of more than 300 Nicaraguans. "The findings of the visit show that State violence has been used with the aim of discouraging participation in demonstrations and that it has followed a common pattern characterized by: an excessive and arbitrary use of police force, including deliberate and systematic use of lethal force, the use of vigilante groups with the acquiescence and tolerance of State authorities, interfering access of the wounded to emergency medical care in retaliation to their participation in the demonstrations, a pattern of arbitrary illegal detentions of young people and teenagers who participated peacefully in protests and people passing through areas where incidents took place, the use of cruel, inhumane and degrading treatment against the majority of those arrested (bordering on torture in some cases), the launching of propaganda and stigmatization campaigns, measures of direct and indirect censorship, intimidation of and threats directed to leaders of social movements, and the lack of diligence in investigating the murders and injuries reported in this context. " To this day, no case has been opened against the perpetrators of government crimes - on the contrary, innocent people are being prosecuted as "scapegoats" and proceedings against social fighters keep growing. Until quite recently, the US government maintained a close relationship with the Ortega government. The Nicaraguan president was seen to deliver "peace and stability" in the region. However, the relationship has changed now. Washington has started to express its "concern" over what is happening in the country and, above all, about the consequences of the current crisis. The US is thus pushing for a "soft" exit which would not weaken its position in the region. It is not worried about human and civil rights or corruption, but about its own interests. Since June 11, the government has increased repression through the launching of a so-called "cleansing operation". It consists of combination of regular police forces, riot police and hooded, heavily armed civilians. On June 16, these combined forces set fire to a house with a whole family inside, which resulted in 4 adults and 2 children, one two-year old and one three-month old, dead. Additionally, before the meeting of the Permanent Council of the OAS, Ambassador Carlos Trujillo, permanent representative of the United States before that organization, made a 24-hour visit to Nicaragua and met with the Nicaragua Episcopal Conference (CEN), with members of the Dialogue and with Daniel Ortega. It has been leaked that the United States is trying to pressure Ortega to call for early elections in exchange for immunity (i.e. impunity) for him and his family. Since June 11, the government has increased repression through the launching of a so-called "cleansing operation". It consists of combination of regular police forces, riot police and hooded, heavily armed civilians. In addition to firing indiscriminately and destroying the barricades, they conduct house searches and arrest young people who have been listed by the so-called Councils of Citizen Power (CPC) - pro-government groups which are part of the official structures developed by the government. In the midst of the repressive build-up, several civic organizations have launched the proposal of carrying out civil disobedience, particularly in the case of major taxpayers. The business community, however, hesitates. On June 14, the business chambers finally called a successful 24-hour national strike. People are now pressing for an indefinite strike combined with civil disobedience and street fighting to force the Ortega couple to resign. The Dialogue delegation has grouped itself under the name of Civic Alliance for Justice and Democracy. A Coordination of Social Movements has also been formed, bringing together self-convened students, territorial expressions of the April 19 Movement, the people mobilized in manning blocks and barricades, women movements, peasant movements, human rights organizations, indigenous peoples and African descendant communities, environmentalists, movements defending sexual diversity and the media, among others. The die is cast. 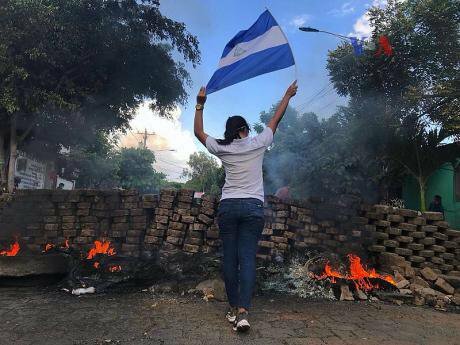 There is no going back: "Ortega lost the people and the people lost their fear" – as the so often repeated slogan has it. However, there is still a long way to go before the tormented Nicaraguan people can see this conflict resolved in their favor.